Direct Wood Flooring periodically provides you with Close-Out items (Discontinued, Overstocked and Sell Off or Irregular) at an extremely low price. Quantities limited on all offers. Sale price applies only to available inventory. All flooring is offered subject to prior sale of inventory and subject to Direct Wood Flooring's Terms and Conditions of Sale. 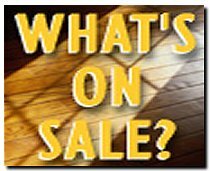 See our Specials page for the FULL listing of specially priced hardwood flooring and accessories.